When you hire the law firm of McCullough & Associates, P.A., you are hiring an award winning legal team. Our St. Paul lawyers have been recognized by their peers for excellence within the fields of personal injury and family law. 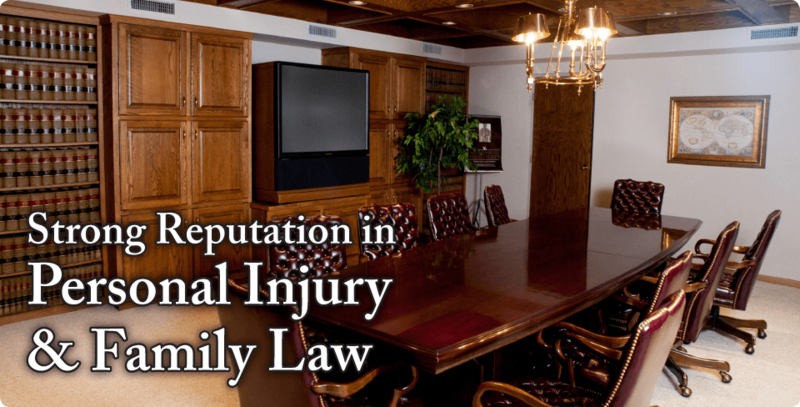 We have earned our reputation for excellence in legal representation, whether for a family law concern or a personal injury or accident claim. You can be confident that the knowledge and experience we have to offer is invaluable, and our devotion to your satisfaction is second to none. We are known for our experience, our professionalism, ethical conduct, and our results. At McCullough and Associates, P.A., we know that the legal process can be intimidating for some people. That is why we want to offer you the support, attention, and consideration that you deserve. We are a powerhouse when it comes to protecting your rights, but we choose to remain small enough to guarantee you personalized representation and attention from your lawyer and their staff. If you are looking for a St. Paul attorney to represent you in a family law or personal injury claim, look no further. Our legal team has a high level of commitment, honesty and integrity and experience. We have dedicated our practice to supporting the needs of our clients and their families. Minnesota has a no-fault system for divorce, meaning you do not need to prove that you are entitled to a divorce. The bad acts of either spouse are irrelevant in obtaining a divorce; however, these acts may affect the outcome of some of the terms of the divorce. Our attorneys recognize that divorces can be an emotionally difficult time. We work closely with our clients to explain the legal realities of their situation and work to restructure their family in a way that works best for them. There are two forms of custody, legal and physical. Legal custody is the right of a parent to make decisions about a child’s upbringing, including medical and schooling decisions. Physical custody is the right of a parent to have a child live with him or her, and includes day-to-day parenting. Sole or joint custody may be granted depending upon each family’s situation. Our attorneys assist clients in determining a custody arrangement that is workable for them. Parenting time (previously known as visitation) may be awarded if it is in the best interests of the child. If parenting time is awarded, a parenting/visitation schedule must be created. Most of the time, parenting schedules depend largely upon the age of the child and the ability of the parents to communicate. Our attorneys work with each client to create a parenting schedule that is tailored to their unique family. Minnesota uses a strict calculator to determine child support. Both parents’ incomes are used and compared with the allocation of parenting time, along with input of various expenses for child care and health care. Child support can be modified in certain circumstances. Alimony, also called spousal maintenance, may be awarded to a spouse in a dissolution proceeding. This determination is based upon the need of one spouse as compared with the other spouse’s ability to pay. A spouse’s need is determined by comparing the standard of living during the marriage with the spouse’s ability to be self-supporting. Alimony may be granted on either a permanent or temporary basis. Upon divorce, each spouse generally retains his or her non-marital assets, which may include property owned prior to marriage, gifts, and inheritance. Non-marital assets may require elaborate and detailed tracing to show that the property is truly non-marital. Non-marital property may become marital property if each spouse contributes financially to property during the marriage. The court will then divide the remaining marital property in an equitable fashion. An individual involved in a car accident may have a no-fault claim against his or her own insurance company, as well as a liability claim against the other driver’s insurance company. Our attorneys work with our clients to ensure their medical bills, prescriptions, mileage, and wage loss are all paid for by their no-fault insurance company. In addition, we perform an investigation and prepare our client's file in preparation for their liability claim. In the event an individual is injured by an intoxicated individual, he or she may have a claim against the establishment that served the individual. To successfully bring a liquor liability claim, the injured individual must either prove that the intoxicated individual was clearly intoxicated when the establishment served him or her, or prove that the intoxicated party was a minor. When an individual’s death is caused by a wrongful act or omission of another, a representative of the decedent’s family may pursue a wrongful death claim. A wrongful death claim may include compensation for loss of companionship, loss of financial support, loss of childcare, and/or loss of medical benefits. A property owner has a legal duty to keep their premises in a safe condition. If the owner knew or should have known about an unsafe condition on their premises and did not fix it within a reasonable time, an individual who was injured because of that unsafe condition (such as a slip and fall), may have a claim against the property owner. Minnesota has a strict liability statute for dog attacks or bites, meaning that it is irrelevant whether or not the owner of the dog knew or should have known the dog would attack. An injured individual only needs to prove that he or she was bitten by the dog while lawfully on the premises and that they were not provoking the dog to attack. Our founder, D. Patrick McCullough, has been named a Minnesota Super Lawyer every year since the honor began. His attorney-peers have also named him to one of the most prestigious family law appointments in the country, the American College of Family Trial Lawyers, an honor limited to only 100 lawyers in the entire country. We are here to help. Email or call us for a consultation. The American College of Family Trial Lawyers (ACFTL) is an exclusive group of only 100 family law lawyers from across the country. Pat McCullough is one of three active members from Minnesota. Attorneys invited to join the ACFTL have not only demonstrated their extensive skills in litigation and the courtroom, but have worked with the some of the most sophisticated clients going through a divorce while facing complex personal and business situations.